Finally scientists have confirmed what we saw coming from 6,000 miles away: pacific bluefin tuna are now contaminated with significant amounts of radioactive cesium and who-knows-what other isotopes. Testing of bluefin tuna caught off the coast of California revealed that every one tested contained radiocesium in concentrations as much as 10bq/kq. To put that number in perspective, 100bq/kg would be considered low-level radioactive waste under U.S. environmental law and require special disposal. So, it’s only 10% as bad as officially radioactive waste. Yum! The numbers are truly shocking. Some of the higher ones would qualify as high-level radioactive waste. These tuna almost certainly were born off the coast of Japan and recently migrated to the U.S. west coast. The really bad news is that scientists expect the levels to get worse over the next year as tuna that have spent longer in Japanese waters continue to migrate across the pacific. At this point, unfortunately it isn’t just the jokes that stink. 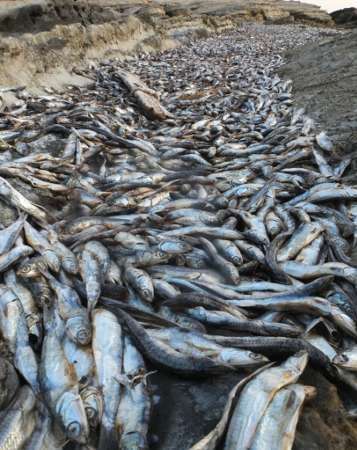 It appears that 200 metric tons of sardines have washed up on the shore in Chiba Prefecture, and the odor can be smelled quite a distance from the port. Strange fish kills have been on the rise for years due to the havoc humans have been wreaking on the environment, but the proximity to the largest industrial accident in the history of the world is definitely suggestive of a cause. While Fukushima has certainly brought the issue of radioactive fish to the forefront, such contaminated fish have been a fact of life for some time.In August, 2011 Reuters reported that Strontium 90 was found in fish caught in the Connecticut River downstream from the aging Vermont Yankee nuclear waste generating station. Radioactivity continues to be a significant problem in the Baltic Sea nearly 30 years after the Chernobyl accident. In addition to the Chernobyl legacy, a number of nuclear plants continue to release radioactivity into the Baltic. News media both in Japan and worldwide have parroted the line that the ocean will dilute the radionuclides to insignificant numbers. But history clearly shows that radionuclides persist in the marine environment and accumulate in food chains to a significant degree for a very, very long time. Dilution isn’t a very assuring idea, when there are 439 nuclear reactors around the world, all of them releasing radioactivity in the environment! This blog is loaded with info on how to protect yourself from radiation. If you haven’t already, I highly suggest reading my posts on Probiotics, Vitamin C, Vitamin D, and Pectin, and check out the archives as well. In addition, I encourage you to limit your intake of seafood, especially from the Pacific. Avoid larger predatory fish, such as tuna or shark that tend to bioaccumulate toxic elements. This list describes which fish to avoid in order to decrease mercury exposure, and similar principles should apply with radionuclides. I also encourage you to practice anti-nuclear activism and make personal choices that decrease our dependency on nuclear power. So the sunflowers DID concentrate radioactive cesium in soil. It was not where the Japanese government wanted you to find. According to one Iitate-mura villager, Mr. Itoh, who had his sunflowers tested, the radioactive cesium was IN THE ROOTS. He suspects that the government knew, and cherry-picked the data that seemingly supported the foregone conclusion that sunflowers do not work in decontaminating the soil. Why? Because the government wants and needs to distribute big money to big businesses that closely work with the government in the “decontamination” bubble that they’ve created. Sunflower roots: Cesium-134, 39,500 Bq/kg; cesium-137, 52,100 Bq/kg; total 91,600 Bq/kg. Since the roots were burned at low a temperature, the roots were reduced to only one-quarter in mass. 2,200 grams of the roots were burned, resulting in 460 grams of ashes. 91,600 Bq/Kg of Radioactive Cesium from Sunflowers in Iitate-mura, Fukushima | EX-SKF. CEREA simulations: US & Canada more contaminated than Western Japan? CEREA, is a French environmental and atmospheric research center. 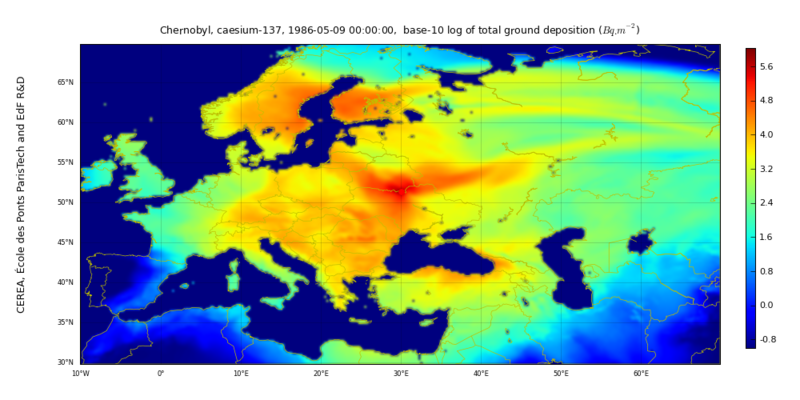 The following two maps represent computer simulations of the deposition of cesium 137 from the Fukushima and Chernobyl accidents. The simulation from the Fukushima accident shows an area of high deposition in eastern Japan, and very little deposition in western Japan and Hokkaido. The United States and Canada appear to have a received a much less concentrated deposition than eastern Japan, however, especially Alaska and the Pacific northwest have been deemed to have received significant fallout, though much lower than that received by almost of Europe after the Chernobyl Accident. The maps are quite informative, particularly when compared to each other. However it must be stressed that these are merely educated guesses rather than actually measurements of what has happened. Fluid dynamics are notoriously difficult to predict, pointing to the necessity for ongoing testing and research for levels of environmental contamination. Radioactive fallout does not happen evenly. It is highly dependent on precipitation, leading to areas that may be significantly more radioactive than others . Further, once fallout lands, it has a clear tendency to concentrate into hotspots. Low places, such as gullies or puddles are prime candidates. For comparison’s sake, let’s put up a map of Chernobyl. This is somewhat reassuring, in that most of the US has received less contamination than Europe as a whole. CEREA considers the Chernobyl simulation to have more certainty than the Fukushima simulation, due to the data that has been gathered since the Chernobyl accident, however, it is still a simulation. So, for Japan, the good news is that western Japan and Hokkaido seems relatively unscathed. Unfortunately, the Japanese government seems intent on shipping waste all over the country for incineration, which is not a bright idea. For North America the bad news is that radioactive fallout from Fukushima appears to be widespread, though the levels are not terribly high. There is reason for concern, as we have added to our overall levels of exposure to ionizing radiation and environmental toxins in general. However, following the guidelines for a radioprotective and anti-cancer diet and lifestyle should far outweigh the risks associated with this level of contamination. Powdered Pectin – cool, right? Pectin is undoubtedly one of the most amazing tools in the radioprotective arsenal – but first of all, what is it? Pectin is a soluble fiber found in fruits and vegetables. It is best known as a thickening agent for jellies and jams, however, it is a powerful detoxifier for the body. Pectin is found to some degree in almost all fruits and vegetables, however the amount of pectin is commonly around 1%. Most of the pectin is often found in the skin of fruits. For example, an orange peel may contain up to 30% pectin. Most commercially produced pectin is made from skins leftover from making orange juice and apple juice. Following the Chernobyl accident, a great deal of research went into how to efficiently remove radionuclides from the body. Since then, decades of research from around the world has shown that pectin is extremely effective at removing radioactive cesium from the body. A randomised, double blind placebo-controlled trial was conducted with 64 children originating from the same group of contaminated villages in the Ukraine. The average reduction of the 137Cs levels in children receiving oral pectin powder was 62.6%, the reduction with the placebo was 13.9%. No child in the placebo group reached values below 20 Bq/kg BW (which is potentially associated with specific pathological tissue damage), with an average value of 25.8 +/- 0.8 Bq/kg. The highest value in the apple-pectin group was 15.4 Bq/kg, the average value being 11.3 +/- 0.6 Bq/kg BW. A study published in 2007 indicates that children in contaminated areas of Belarus continue to have high cesium levels decades after the explosion, and that treatment with pectin continues to be a useful treatment to reduce the radioactive load. Pectin has also been used as a chelator for other heavy metals, including mercury, arsenic, lead and cadmium. It is important to consider that toxins in the body have a negative synergy. A non-life threatening dose of mercury along with a non-life threatening dose of lead becomes life threatening. Thus, it is vital to cleanse the system of heavy metals along with radionuclides. A study conducted by Dr. Eliaz in Sebastapol, CA, administered modified citrus pectin at a dose of 15-20 grams per day to subjects with normal body loads of heavy metals. In the first 24 h of MCP administration the urinary excretion of arsenic increased significantly (130%), On day 6, urinary excretion was increased significantly for cadmium (150%). Lead showed a dramatic increase in excretion (560%). Pectin and citrus peels have even been studied as cheap methods of removing heavy metals such as Cadmium from wastewater. Interestingly, one study concluded that even citrus peels with the pectin removed acted as heavy metal chelators, indicating that pectin isn’t the only active chelator in citrus peels, though it is definitely the most effective. The US National Institute of Health describes a number of different pathways by which modified citrus pectin prevents metastases and induces apoptosis in a variety of different types of cancer. As mentioned in the post on that topic, probiotics are essential to a radioprotective diet. In turn, prebiotics are essential to probiotics, they are food for the beneficial bacteria. In order to take advantage of this prebiotic function, probiotic supplements often include some kind of prebiotic fiber, commonly pectin or inulin. In addition to feeding the beneficial bacteria, pectin, like other forms of dietary fiber, will help keep your colon moving, and therefore eliminating toxins. Pectin is an effective treatment for both constipation and diarrhea, which is a rather remarkable balancing act. The fact that diarrhea is one of the common symptoms of low-level radiation sickness, this makes pectin even more relevant as a radioprotective nutrient. General Mills and other cereal makers have drilled the mantra that oat fiber helps improve heart health, specifically cholesterol levels. Oat fiber is a soluble fiber, the same as pectin. As expected, research has clearly shown that pectin will improve HDL/LDL levels, therefore improving cardiovascular health. The obvious thing is to eat plenty of fruits and vegetables, and whenever the skin is edible, make sure you eat it. The skin of fruits and vegetables are high, not only in pectin, but also in a wide range of antioxidants and other life-affirming phytonutrients. Isn’t it a miracle that simple food is medicine? However, if you want a for a deeper cleansing of the system, you are going to have to ingest more pectin. 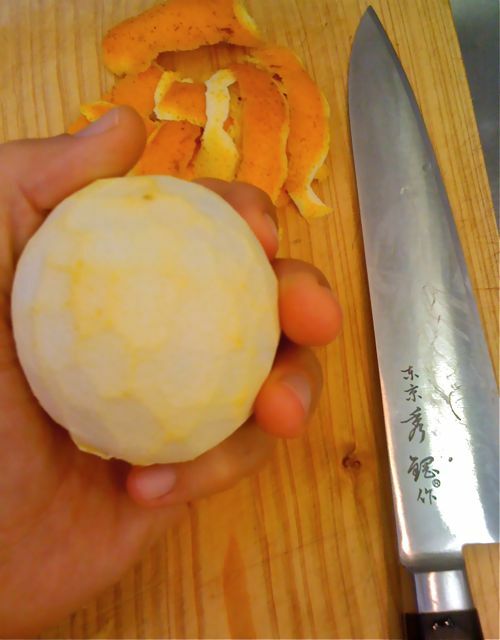 If you have been exposed to radioactive cesium (Hint: Everybody has been, to some degree), you may wish to focus on the easiest whole food source of pectin: the white part of the citrus peel, referred to as the pith. Rutin: antioxidant, anti-inflammatory, assists the body with the assimilation of vitamin C, conveniently found in…drumroll…oranges. For close to 2 years, we have been making fruit/vegetable smoothies in a 3hp blender. If we do citrus (lemon, lime, orange or grapefruit, we cut away the outer colored peel with a knife, leaving most of the white inner peel, and toss the whole thing in the blender. A small juicing orange might have 10 grams of white pith, while a large navel orange might have over 30 grams of pith. Grapefruits are even higher. The king is the giant pomelo fruit. Regardless, back to oranges, if the pith is 30% pectin we are talking about 3-10 grams of pectin from a single orange. 5 grams of pectin is considered a therapeutic dose according to studies done at Chernobyl, though much higher doses are safe. Even if you don’t do smoothies, you can always just peel an orange and scrape the inner peel off with your teeth and eat it! You’ll be getting pectin and a whole lot more. It isn’t always practical to take your blender everywhere and you can’t always find the citrus you might like. 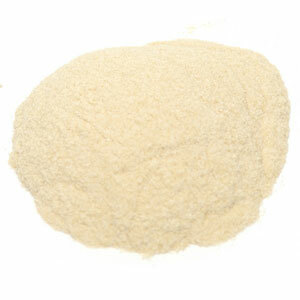 Fortunately, pectin can be found in a concentrated powdered form. A teaspoon of pectin can be mixed into a glass of water every morning. I sometimes mix a teaspoon of pectin with a teaspoon of chlorella and some water first thing in the morning. BELRAD institute recommends taking pectin supplements for no more than a month in a row. What is Fruit Pectin and Where is it Found? Pectin is a substance found naturally in many fruits whose properties make it excellent for use for making jellies. Pectin also has the ability to pull heavy metals and other contaminants from the blood stream through a process called chelation. These contaminants are excreted through normal urination. Pectin is found in the rinds of many fruits and vegetables. Excellent sources of pectin are bananas, apples, cabbage, okra, beets, grapes, carrots and all citrus fruit in the white part called the pith. Eat several servings of high-pectin fruit daily for a natural, gentle detox. One of the best sources of pectin is green apples. Organic apple juice and unsweetened applesauce are also good sources of natural fruit pectin. For a deeper and more controlled detox, find pectin at the grocery store in the canning section. Pectin made especially for chelating heavy metals and drugs is available at health food stores in powdered form. Check labels to make sure the pectin is free of MSG. To use pectin, mix 2-4 teaspoons of dry pectin to an 8 oz. glass of grape juice once a day. Start with a lower dose of pectin until the body gets used to it and increase the amount slowly. Continue taking pectin for a period from 2 weeks to 6 months to complete a drug detox or when chelating heavy metals. Indicators for completing the detox period are a reduction in symptoms. Although there is no such thing as a symptom-free detoxification during chelation therapy, if pectin is taken in small quantities over a period of time, overall health will return as energy increases and disease symptoms disappear. People addicted to narcotics of any form should use pectin only under supervision during drug detox. Pectin can cause problems in people who are sensitive. Some people may experience a flare up of their symptoms during the detox period including dizziness, nausea, joint or muscle pain, weakness and fatigue. Reducing the amount of the dose is usually enough to lessen symptoms making the detox experience more comfortable. Seek medical supervision to help with dosing.